Foosball tables are typically designed for their original homes, in pubs and arcades. So when one looks at the American Heritage Carlyle Foosball Table you immediately realize that the model is clearly a step up from the usual type product in this category. It has a more elegant design than you normally find among the tables on the market, and it looks great in any home. It really gives a home game room a bit of an upscale look to it. If you’re shopping for family foosball table that doesn’t look cheap, but still offers a good value for the money, then this just might be it. Keep reading to learn more about it. The immediate standout for the American Heritage Carlyle model is the finish and make of the wood frame. Finished in a deep, dark mahogany this foosball table is intended for and destined for private home studies and recreation rooms. It would be a pure waste to put a beautiful table like this in any kind of a basic game room etc. Instead, an owner is going to want to show this table off to friends and family visiting and having an evening drink in the social room next to the home bar. 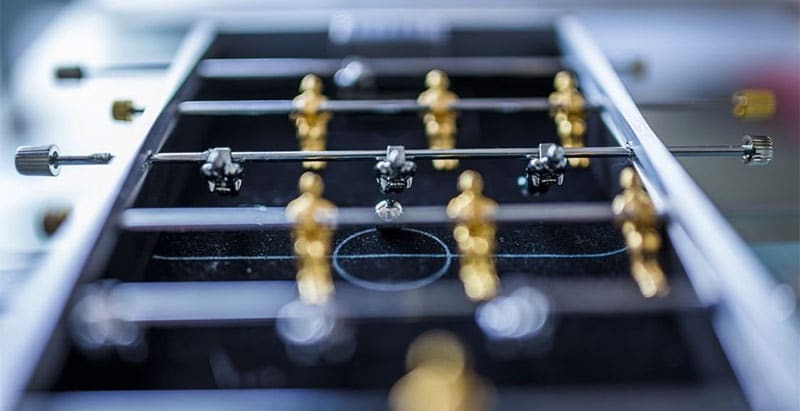 The standard rod and game piece set up is exactly what a foosball table should have, complete with all the field characters, placement, and multiple choices for quick handling and spinning. The ball channels and pockets a fitted exactly where they need to be for easy access as well. However, the playing field is yet another beautiful wood finish, this time in a light color offsetting the mahogany frame work and field sides. Size wise the American Heritage Carlyle Foosball Table measures out to almost a yard in width, two yards in length, and waist height off the floor. The field players are painted in classic English style uniforms with striped rugby jerseys. The field plane has been leveled so much, the only reason there is going to be a dead spot in the game play is due to a user not hitting the ball hard enough with one of the rod characters. In terms of weight, users are going to notice this table has some substance to it and is not so easy to move around. This greater weight content is due to the more substantial solid wood used in the framework versus the typical plastic or aluminum in lower grade tables. Assembly is a very easy process. Complete with instruction, the table comes packages with all the parts clearly labeled and identified. A buyer simply needs to give a good amount of time, don’t rush the job, and make sure to have a cordless handy electric drill with the proper bits available for quick insert and tightening when needed. Most users will receive the table pre-packed via a common courier or shipper. Also, it would be good to plan for a helper during assembly. Due to some facets of the construction, more than two hands are going to be necessary to build the table correctly and lift the parts during assembly. Keep in mind, once assembled, the American Heritage Carlyle Foosball Table is also going to need two people to move around for placement inside your home. Again, this is a solid wood unit with a considerable amount of weight. Once built a person is not likely going to move this unit easily except with maybe furniture coasters over carpet or some similar tool. Using a dolly is more than likely going to be awkward and could scratch up the wood finish, which will be very obvious. If the table is going to be placed in a two-story home, it’s a smarter choice to keep the table packages and assemble it on the floor the table will be placed rather than trying to lug the table up a flight of stairs or two. While there are no specific instructions included on maintenance of the American Heritage Carlyle Foosball Table, it’s a good approach to assume the table finish is a soft-wood style subject to change by harsh chemicals. A gentle wood cleaner/waxer is the safest approach with a fine cloth that is not abrasive. The table should also be kept in a location that doesn’t have direct sun right on the table so that the wood doesn’t dry out or discolor due to exposure and heat. Rooms with significant moisture also, obviously, are not a good choice for placement of this kind of construction. There are plenty of choices for foosball tables, but the American Heritage Carlyle Foosball Table is really a step above par and designed for the player who wants something unique and lasting for his recreation or study room in the house. This one isn’t for the kids; it’s a foosball table for dad or mom and their friends instead. Relive your pub foosball days in style and match your life today with a sense of classic design.